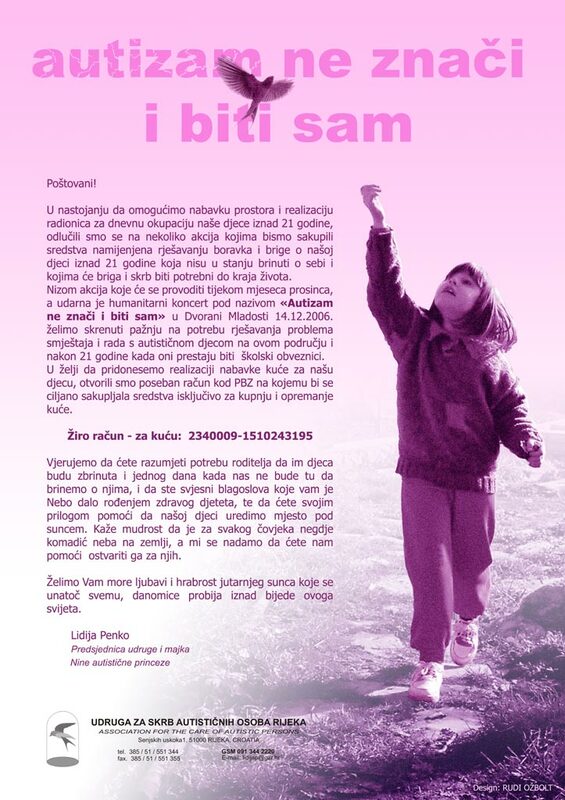 My cousin, Lidija Penko (of Rijeka), has worked tirelessly for years to raise awareness and funding for the autistic children of Croatia. She managed to convince the government to support a special school for autistic children several years ago, and it has been very successful and a godsend for the children and their families. Now the children are growing older, and as a result will no longer receive the services from the school. Lidija's new crusade is to raise funds to provide for the autistic young adults (over the age of 21). They are holding what she calls a "humanitarian concert" on December 14, 2006. I have attached the poster being used to advertise this event. The poster depicts an earlier photo of her daughter Nina, who suffers from this disorder. I hope we can get the word out and generate some interest in this worthwhile charity.